A few co-workers and I were discussing cookies at lunch one day. As the conversation went on, the question of which cookie is the best selling cookie in America was asked, and the answer didn’t surprise us: Oreo. We all agreed that chocolate chip cookies are probably the best selling as a type, but there are so many brands and varieties that one just can’t compete with Oreo for the crown. During that lunch, we decided to conduct a little test with our fellow co-workers. We would set out an equal number of Oreos and Chips Ahoy! on plates in the central area of our department and see which one disappeared first. I predicted that Oreos would win, but the others figured the Chips Ahoy! would win. On Monday, April 21, 2008, we procured a bag of Oreos and a bag of Chips Ahoys!. At 2:30 p.m. we put out two plates, each containing 15 cookies, in the central area of our department where free food is usually left. An email was sent to the department stating that cookies were available, and we surreptitiously kept track of the quantity every five to ten minutes by visually counting how many were left on the plates. During the experiment, I did not eat any cookies from the plates (I had the other two-thirds of the bags in my office, after all), and the other person “in” on the experiment had one cookie from each plate to keep the numbers even. At 2:55 p.m. four Oreos were gone while the Chips Ahoy! plate was missing two. At 3:20 p.m. there were a total of 11 Oreos and six Chips Ahoys! available. At 3:50 p.m. the Oreo plate was down to seven and the Chips Ahoy! plate was down to four. It looked like Chips Ahoy! was going to win. At 5:00 p.m. it was much closer. There were four Oreos to three Chips Ahoy! 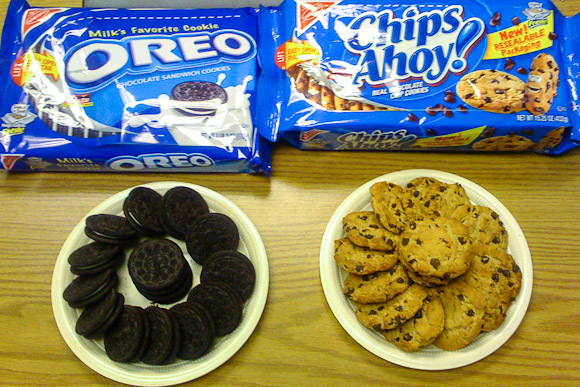 Just ten minutes later, Oreo took the lead with just two remaining while Chips Ahoy! hadn’t budged at three. 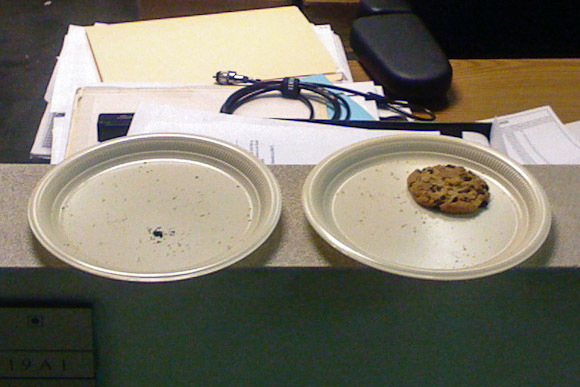 By 5:15 p.m., the Oreo plate was down to one while Chips Ahoy! seemed stuck at three. The race was over at 5:50 p.m. with Oreo coming back from a six cookie deficit and winning by one. During the experiment, one of the others in on it suggested that we “refill” the winning plate with additional cookies to bring it even with the losing plate since people might not take from the winning plate since they don’t want to be the one to finish a plate. We would keep track of how many were added to the plates and the winner would be the one with the most total cookies eaten. This could be a valid experiment since Oreo came back from almost two to one down. That version of the experiment will be conducted in the near future.